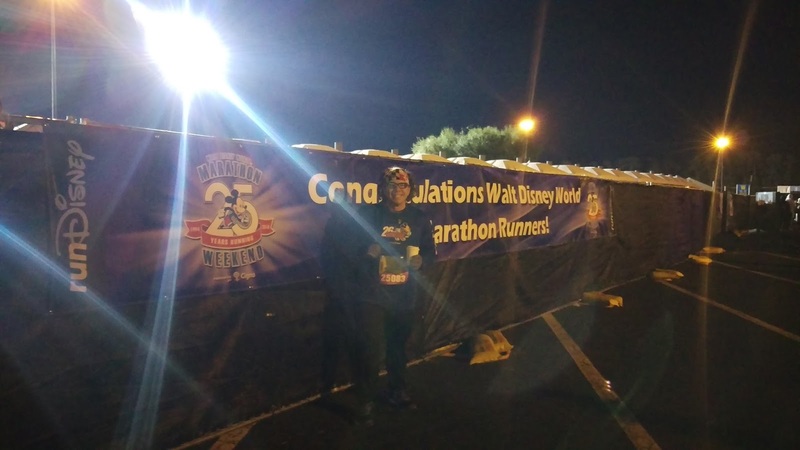 This recap will cover the WDW 5k, WDW 10k, and the Cigna Blogger Event. Stay tuned for recaps of the WDW Half Marathon and the WDW Marathon! We woke up on Thursday morning to absolutely freezing temperatures. Now, before we go any further, yes, I know that there are several places around the world that are colder than 29 degrees. However, it's rarely 29 degrees in Florida and because it's so damn humid, all the water in the air makes it feel so much colder! Anyway, back to Thursday morning: Matthew put on his planned 5k outfit and then added a bunch of layers. 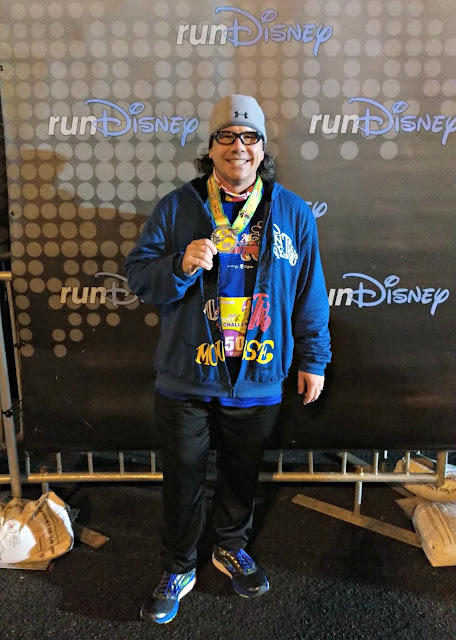 I wore thermal pants/shirt, leggings, jeans, two long-sleeved shirts, an Under Armour sweatshirt, a neck gaiter, two pairs of gloves, hot hands, a hat, and a bathrobe (that I brought as a throw-away for the marathon). And I was still absolutely frigid when we left our room at 3:30 am to catch a bus to the race start. Matthew loves 4 am pictures! 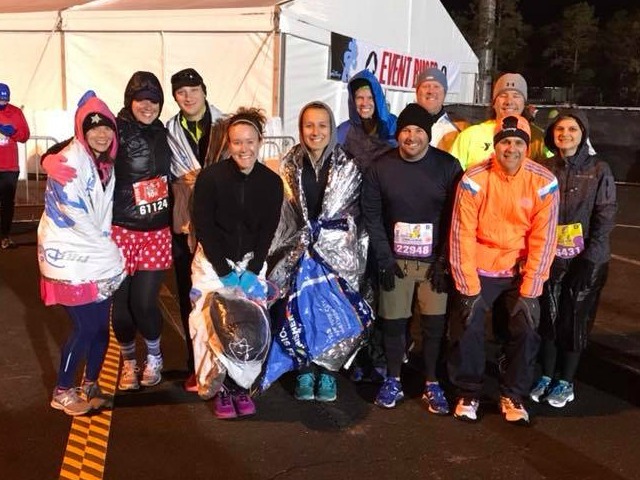 We met up with our running ohana and huddled together for a while until the runners had to go into the corral. This was Matthew's first race of the Dopey Challenge and he planned to take it easy- so I knew I'd have about an hour from the time the race started to see him finish- he was in corral D so we figured he'd start the race about 20 minutes after it started. 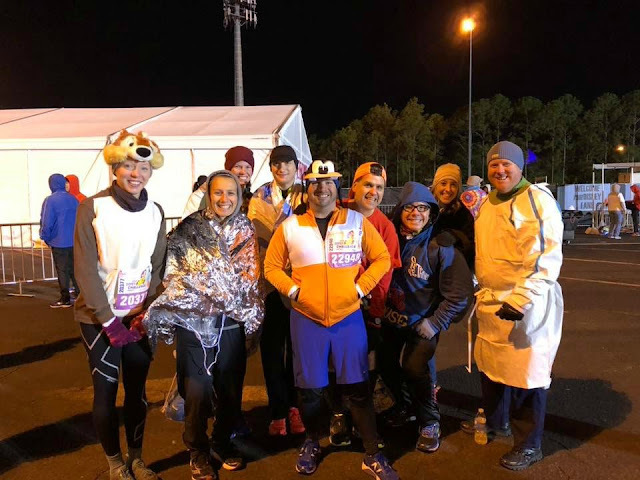 After Matthew and all the other 5k-ers went to the corrals, the remaining spectators (probably about 200 people total) all huddled around the heaters that runDisney had brought in to try and help folks stay warm. 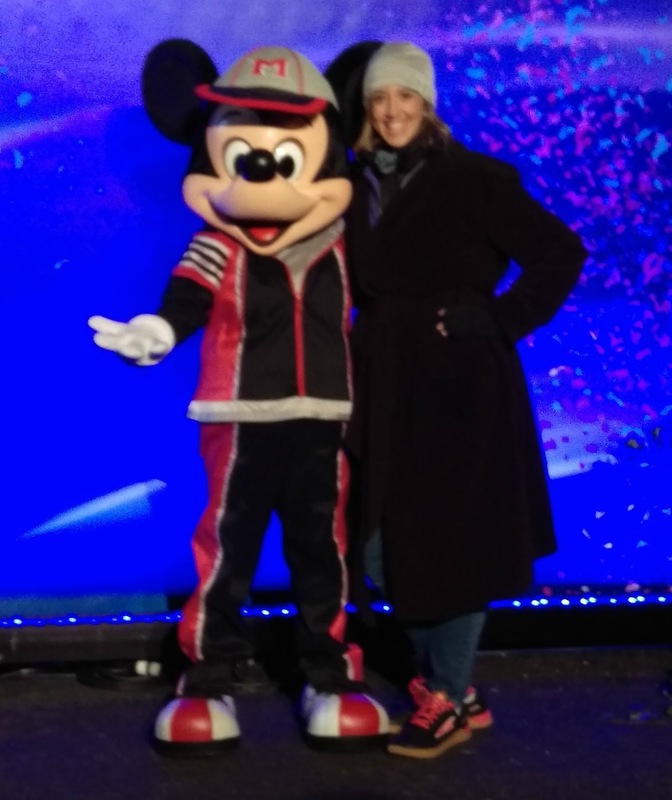 I jumped into the line for Mickey (they had characters out before the race) and got a blurry picture with my favorite mouse while wearing a bathrobe. Though I never really warmed up while huddled around the heater, I did talk to some cool people about Altras (spotted two guys wearing them), chatted with a family that had come from Australia to run the races, and helped calm the nerves of a woman who was running her first marathon later that weekend. One of the things I love about runDisney races is the general camaraderie of the folks that run them- it's easy to make new friends at marathon weekend! 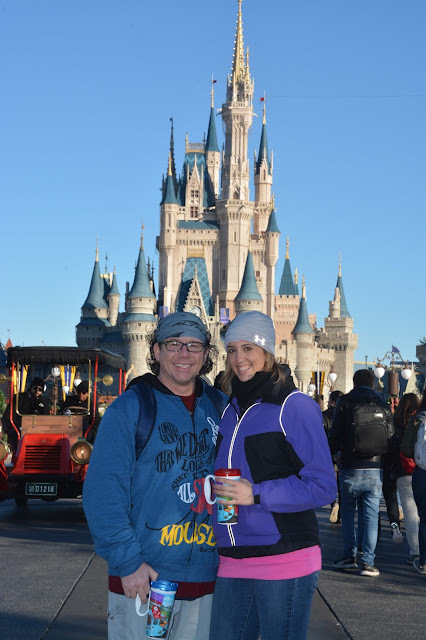 A cold day in the Magic Kingdom is still a day in the Magic Kingdom. 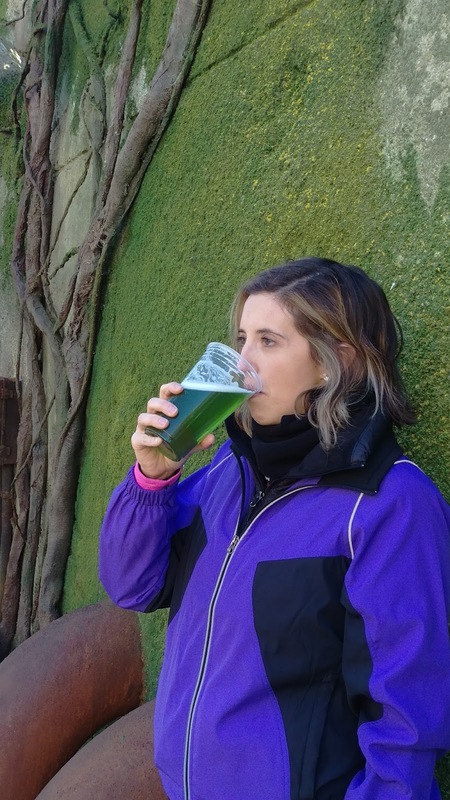 Pandora: where the walls are as green as the beer. After a successful half-day of park-hopping, we repeated the events of the night before and were all tucked into bed by 7 pm with an alarm ready for 2:30 am. Friday morning I woke up and immediately knew something was wrong- my throat was sore and scratchy and I felt horrible. I started to get dressed, took another Airborne (we'd been on a steady diet of Emergen-C every day for the previous week to avoid getting sick), and tried to assess how I felt and if I really wanted to stand out in the cold for another few hours that morning. Matthew took one look at me and told me to get back in bed. Reluctantly, I put my pajamas back on and climbed back in bed. There may have been a few tears when I realized I was going to miss his race- but I knew I needed to rest. Matthew headed off to the 10k and I went back to sleep. I finally woke up when Matthew came in from the race- he had a great time and really loved the whole experience- he said everything went smoothly and he never felt too crowded along the course. He was pretty tired so he took a shower, climbed back into bed, and we both fell back asleep for another few hours. Once we arrived at the Atlantic Dance Hall, we got a name tag and a character sticker. The sticker let us know our assignment- I was on Team Minnie! 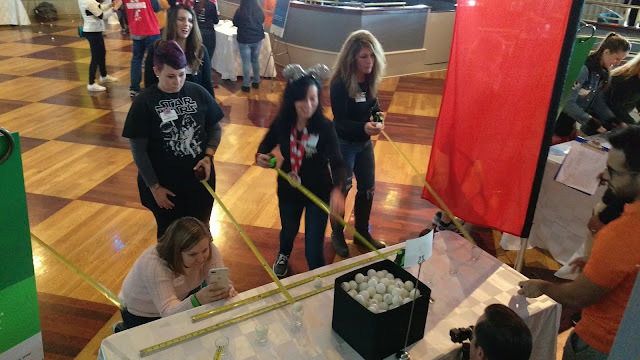 This blogger event was going to be based on "minute to win it" games and we knew we'd be competing against other bloggers in teams, similar to last year's event. Cigna had a beautiful buffet lunch set up for us so I spent some time eating and meeting other bloggers. 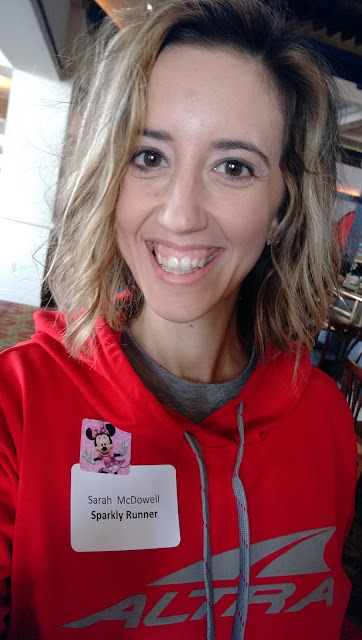 I was able to meet the team from Joyful Miles in person and got to see more runDisney friends: Justin, Gelcys, Emelia, Dani, Katherine, and Kristin. Yakking it up with the Joyful Miles crew! Photo courtesy of Cigna. Eating and taking selfies: two of my top skills. 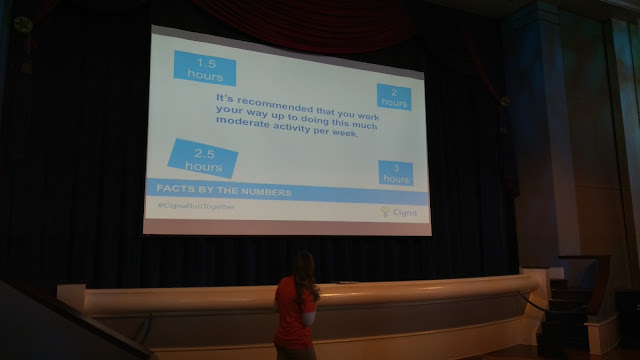 Photo courtesy of Cigna. Welcome Bloggers! Photo courtesy of Cigna. After lunch, we split into teams based on our characters and played a ton of "minute to win it" games. 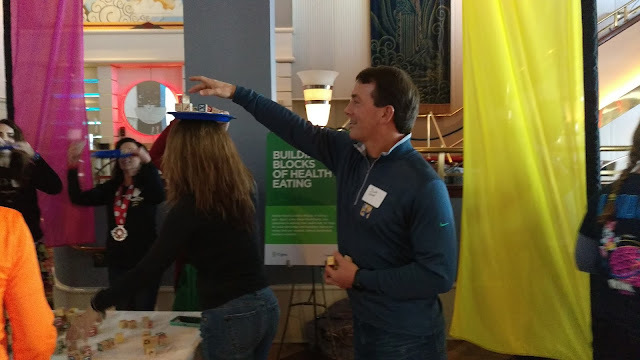 They all had some connection to overall health and "knowing your numbers" and I honestly learned a lot about nutrition and healthy guidelines while we were trying (and failing!) to score points at the games. This game was HARD! Photo courtesy of Cigna. The Dance Hall was set up into multiple stations/games. Photo courtesy of Cigna. Just seconds before all these blocks fell- it's no wonder we didn't win! Ha! Photo courtesy of Cigna. Team Minnie trying to control a bunch of ping-pong balls into shot glasses. Unsuccessfully, of course! In between two rounds of the "minute to win it" games, we played a round of health-related trivia. Surprisingly, for a group of fitness/running bloggers, we didn't get all the answers right! We had a blast guessing though! And the correct answer is...? The last round of the game was a kind of lyrics contest. Each team was given a buzzer and the DJ would start playing a song and then stop it at a particular place. If we knew the next song lyric we had to buzz in and then we had to actually sing it in front of everyone! Team Minnie totally dominated this part of the contest! High-fives after another right answer! Photo courtesy of Cigna. We weren't having any fun. Nope, none at all. :-) Photo courtesy of Cigna. Unfortunately, our tremendous singing ability wasn't enough for us to place in the top three once all the points were counted. But, we still got a sweet surprise- photo opportunities with Minnie and Mickey- as doctors! Bloggers + Mickey + Minnie= All smiles. Photo courtesy of Cigna. Two doctors and a runner. Photo courtesy of Cigna. 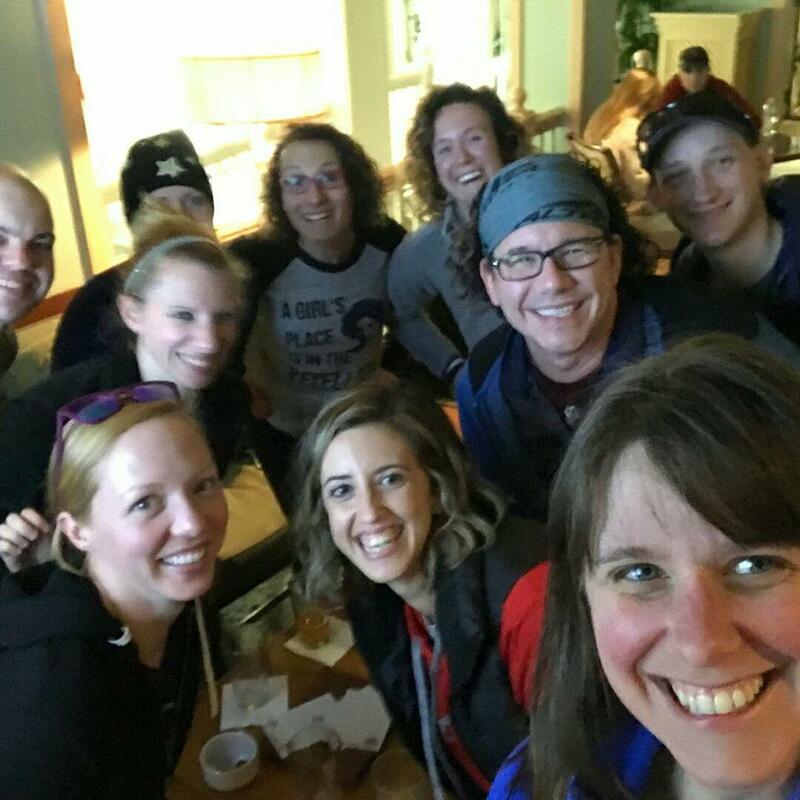 The Cigna Blogger Event this year was so much fun- I laughed the whole time and had a blast getting to know other bloggers. The games were challenging and exciting and I know I'm not the only blogger who learned a lot about nutrition and good health guidelines during the trivia rounds. Thank you, Cigna, for a great afternoon! Once we left the event, we grabbed a few drinks with some friends/bloggers and then headed over to Disney's Beach Club for another running ohana meet-up. Spending time with friends (who live all over the country- and globe!) is one of the very best parts of a runDisney race weekend. By the end of the afternoon, I was fading fast- Matthew and I jumped in a cab and headed back to French Quarter to make our 7 pm bed time. We had 13.1 magical miles waiting for us in the morning- my road to unofficial Goofy was about to begin! Coming up next, WDW half marathon and WDW marathon recaps! Disclosure: Cigna invited me to be part of their blogger program for 2018. I received lunch and a Disney gift card for attending the Cigna Blogger Event. As always, all thoughts and opinions are my own.